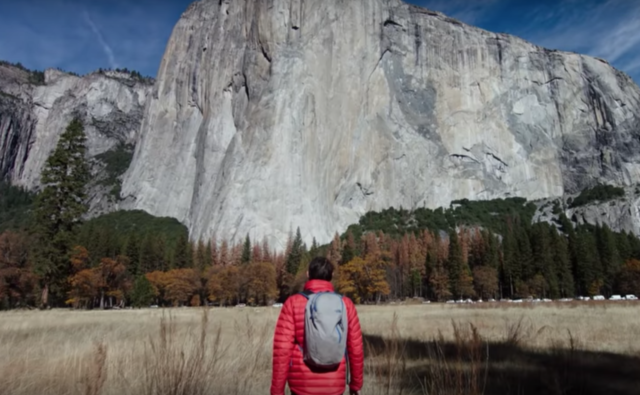 The super secret member screening turned out to be “Free Solo.” And it was so good that Milwaukee Film is bringing it back to the Oriental for more non-secret screenings. It’s a documentary about a man who wants to climb a really big rock. Without any harnesses or ropes. It is thrilling, anxiety-inducing and filled with stunning visuals and nature photography. People came out of the theater clutching their hearts. Some didn’t even make it to the end because they couldn’t take the intensity. It’s a ride. You can see it at the Oriental through November 15. We’re 88Nine’s Justin Barney and Milwaukee Film’s Kpolly. We’re buds, we like cinema—we’re Cinebuds. This week on the podcast, we’re still talking about the Milwaukee Film Festival because it was that great. And some of the best films are coming back to theaters in Milwaukee soon. Read more and listen to the podcast episode below to hear about our standouts of the festival and which movies you have a chance to see again if you missed them the first time (or want to see them a second). This is the first shorts screening at the Oriental outside of the fest. We hope it’s not the last because shorts are so fun. In these, you’ll never see “it” coming, and that’s why we like them. These shorts feature surprises around every corner—Alfred Molina, paper-thin walls, a harmless joke, and the class of ’97 – what could it all mean? No telling – we don’t want to spoil the surprise! See this program at the Oriental November 7-8 during these showtimes. Kpolly says that he wishes this one got more screenings during the festival. Not to worry though, he also says that we should look out for it coming back to the Oriental in January. We don’t even have to say anything about this movie. Just watch the trailer. And go see it in January. There was only one screening of this beautiful film during the fest. Now, we have one more. When Summer’s mother converts to Islam, the carefree life the 17-year-old had been living heading into senior year is thrown into upheaval. At first resistant to her mother’s newfound faith, Summer slowly warms up to the notion, trying to integrate these new beliefs into her previous Instagram-based existence, all in an attempt to suss out her true identity. A winning portrait of female self-empowerment and religious tolerance, Jinn is anchored by the endlessly charismatic performance from newcomer Zoe Renee. See it at the Oriental on November 15 at 7 p.m. This is a strange movie done in a grand, theatrical way. Emotionally troubled Madeline (Helena Howard, in an all-time great acting debut) has become integral to her experimental theater group, with her ambitious leader (Molly Parker) encouraging her to tap into her rich interior life—including a troubled relationship with her mother (Miranda July)—as grist for the collective’s art. Lines between performance and reality blur, leading to a breathtaking finale that solidifies this as “one of the boldest and most invigorating American films of the 21st century” (IndieWire). Keep your eyes peeled for MFF2017 alum (Bronx Gothic) Okwui Okpokwasili! See it again or for the first time at the Oriental through November 15. This one was the winner of the Herzfeld Competition Award at the 2018 Milwaukee Film Festival—and it’s back. “Witness a new cinematic language being born” (Village Voice) in this evocative and impressionistic portrait of life in rural Hale County, AL. We follow their day-to-day existence in this area populated mostly by black, working-class families, as this collection of seemingly innocuous moments begin to form a jaw-dropping mosaic of life in the American South. Gorgeous photography supports this stunning work of visual poetry, a quietly profound picture that presents an entirely new way of seeing Black men and women apart from film’s constrictive and conventional history of representation. See it at the Oriental through November 15. And, check out RadioMilwaukee.org/Podcasts for our full lineup of weekly podcasts, delivered right to your computer or device. Available on our site, on iTunes or wherever you get your podcasts. Cinebuds is brought to you by Associated Bank.